Everyone experiences loss at some point…or many times in life. We all have a natural mechanism for processing grief, working through the experience of pain, unique to each of us, but common in our pain. 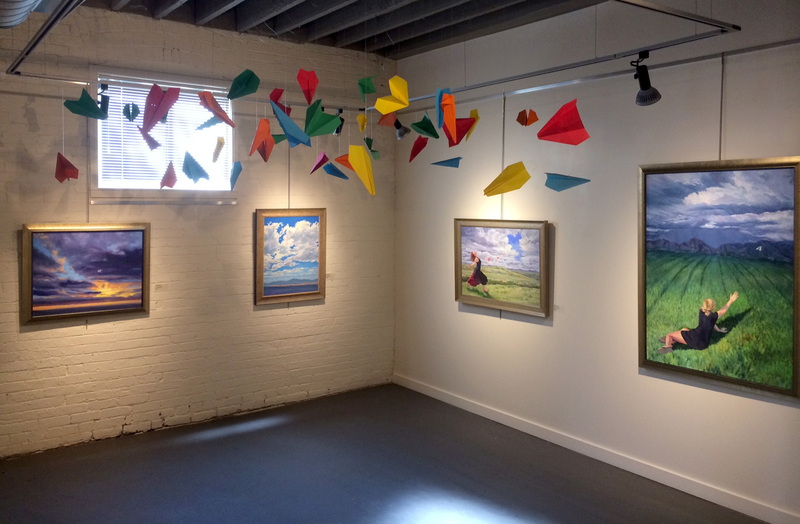 When Fehr lost her father just months before her scheduled exhibit at the gallery, she turned to her primary life vocation, painting, to heal, and found a whole new body of work developing. Taking Flight takes the viewer through the vision, spirit and expression of Fehr, to experience the spirit of the soul being released from the bonds of loss, and the experience of transcendence in liberation. The paintings speak through a broad range of emotive responses, but they are generally something bright, upward lifting, open—a soaring sense of positivity, truth, and universality, responding to ethereality with mortality. A seeming exception to this is “Mending a Broken Heart,” which might be considered abrasive or disturbing, but is quite the contrary. 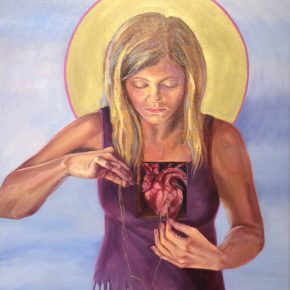 Even though a woman, with a golden halo behind her head, has a needle and thread, and through an open window to her chest is sewing into her own heart, the painting is spiritual in nature. The subject is a perfect representation of the artist healing from the death of her recently departed father, at the place where the relationship with her father was experienced. Her dress is in shards, and, surreally, there is vacant space where her legs should be. She must heal this cavernous wound within her or she cannot move on. 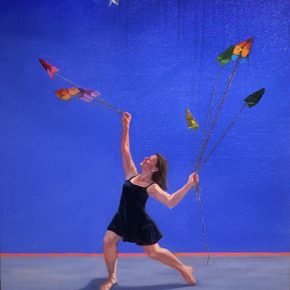 The many paintings with planes and figures show this process of release and moving on. Central to these paintings is also the sky — open, massive, azure — another motif playing a role with the airplanes, as a symbol of healing. When loss is dealt with, there is healing, as in these landscapes: the clouds have broken and the light is shining, a metaphoric imagery of emotional experience. There is cloud as the scar will always be there to cast a shadow, but there is beauty in grief overcome. 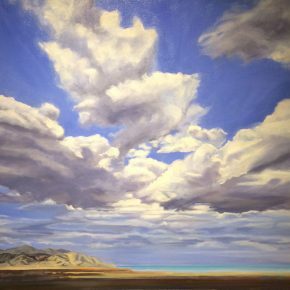 “Heaven’s Dance” is a revelation of just how wonderfully Fehr is able to render a glorious sky, and how well she is able to capture the essence of the infinite and fecund dance of sky, the synchronicity with the infinite and fecund human spirit. This sky is an expression of the sublime, of the experience of the artist in an infinite duality of pain, made magnificent in beauty that comes with healing and growing. The essential halcyon reality of “Heaven’s Dance” is complemented by the massiveness of “What is Essential is Invisible to the Eye,” where the vastness of emotional and spiritual experience is what is most important in life; that which cannot be seen is that of most value. 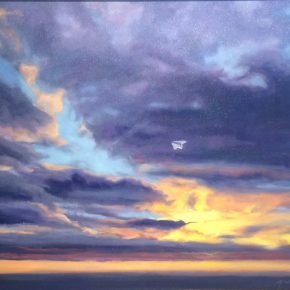 These two unite in a third landscape, “Going Home,” where among the fading clouds, the fall of light, and the last vivid radiance of day on the horizon, there is one white paper airplane, crafted by Fehr’s father, holding steady, gliding into the great expanse. Life is constituted of suffering, concentrated moments of regret, grief and loss. Loss can cause devastation into grief, and grief might leave destruction in regret. Kindra Fehr is not absorbed in regret, but has taken a massive leap ahead, and uses what she knows and loves, painting, to learn and grow from a transcendent reality that all can learn and grow from. 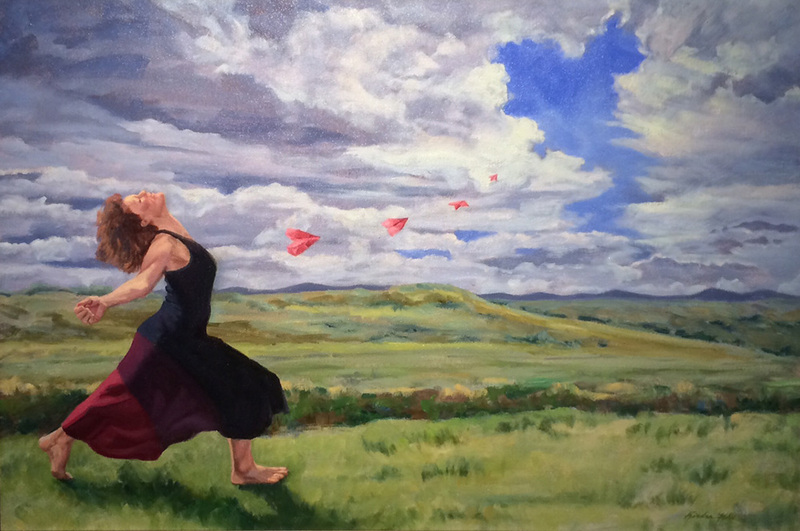 ”Taking Flight,” paintings by Kindra Fehr, is at Art Access Gallery in Salt Lake City (230 S. 500 West, #125) through November 13. Ehren is a beautiful writer…and a great “feeler” as well. Ehren makes every effort to understand and support art in many varied expressions. I am so happy to be his friend and I’m always excited when he chooses to write about my paintings. His insights are so tender. A writer of his depth in Utah is a gift to us.